Your galley will be tight! I still found the 1/8" Baltic birch splinters too much for my taste. You might try putting a piece of masking tape over the Baltic and then drilling the pocket. Thank you Tony. When Shelly saw how big the galley will be (as opposed to how much she wanted to carry back there) she said the same thing. But I believe she meant something else all together! I plan to cut out the door openings from the wall tomorrow, and then I'll have some scrap outer wall complete with fiberglass and sanded epoxy, so I can see how clean my jig holes come out on that side, in case I decide to go with that. What seal are you going to use with your doors? This is an area I haven't got lost in yet –- door building. And a good one at that. 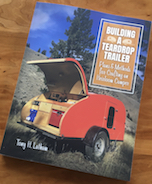 As you well know, building a teardrop is labor intensive. I'm guessing DIY door will add a week onto my next one. What was the bottom line on the doors with shipping? If I could do it in a week, and be pretty sure of the quality of the end product, I might at that price. (Especially if I were retired full time.) But, of course, one still need windows, hardware, etc. In our situation, this was worth the price. At our age, Shelly and I have lots of baggage. But we're hoping if we can store enough gear in our camper, we'll be able to get away for weeks at a time, and maybe forget the baggage for awhile! Cut the hatch sides this weekend, and cleaned the edges with a router. Felt a little stress going into that, I suppose because any mistakes would be difficult to recover from, but it came out okay. I also glued the 1/8" spacers on. Plan to glue on at least one of the outer galley sides on this evening. Then varnish them in the evenings this week. Really debated whether to cut the pocket holes (to hold the walls to the floor) from the outside or in, but just this morning decided we would do it from the inside. Drilling with masking tape, the holes didn't come out too ratty. Of course they will be covered by the mattress, so it really doesn't matter, but I'd rather keep it all as good looking as possible, even if it isn't seen every day. I did order some plastic pocket hole covers, which I hope will cover most of the tear out. Ordered some "dark coffee" and "light coffee" and figure one of those should complement the varnished Baltic birch reasonably well. Hated the thought of trying to fill all of the holes from the outside with epoxy and filler, particularly since they would be vertical. Also found that the 1 1/4" screws I bought are not long enough. Ordered some 2 1/2" SS screws but won't see them for a week, so it'll probably be two weeks until we erect the walls. Still have to make the deadmen in any case. But we're getting closer! Bad luck this weekend! In the course of fiberglassing the outsides of our walls, we put a few minor scratches on the varnished inside. "No problem" I thought, I'll just put another coat on while varnishing the galley sides. All along the varnish had gone on really well. Not this time! Shelly came down to look, prepared to say something like "Oh, you're the only one who will notice, honey!" In the event she said "Oh, you'll never be happy if you leave this as is!" So, we'll let it dry for a week, sand it down and try again. It'll be a few more weeks before we try erecting the walls. Not sure what went wrong. Maybe I had the heat set too high Saturday morning, or I unconsciously tried to put too light a coat on, or something. The wall with the scratches actually came out okay, but the other one (which I figured I should varnish to make them look consistent) is the one that mottled up, left brush marks, high and low spots, etc. Guess we'll probably sand them both down and redo the varnish. Think we're on track to fixing my cabin varnish fiasco. Last weekend I sanded one wall down while the garage doors were open, then gave it a day for the dust to settle (literally) and put on a new coat. After two coats it looks okay, I guess. It's so smooth now, I can see brush strokes when the light is wrong. I'd originally started with the wood unsanded just so the surface would be rough enough to hide that. Still have to do all that with the other side. Came out okay. I knew our floor drooped in the galley (due to the trailer), but think I can fix that with some temporary shims while we glue and screw the walls. The Climateright is going in the front, just on the other side of the headboard from my head. We made it 1.5" thick with foam, so hopefully it won't be too loud. We will have side cargo access doors, and a big one in the front that will stay open (gas struts) while the AC is running. At 70 lbs, I didn't want to move it outside to use it. the rest of the front will be storage and will also have a few junction boxes for the wiring from the tow vehicl, etc. The headboard bulkhead didn't fit quite right, so I guess my afternoon job is to fix that. (Sanding out the notch in the wall.) Our plan is to build a horizontal piece above the front storage, that will be a little interior storage behind our heads. I'm embarrassed about that gap above the headboard in the wall. We'll have to trim that in an attractive manner, somehow. The galley bulkhead fit much better. We plan to have one AC outlet, one set of USB outlets, and a 12 v cigarette lighter style outlet back there. The unvarnished strips, of course, are where we will have cleats for the shelves above our feet. On the galley side, I plan to build the electrical box above the counter, which will hide the back of the bulkhead outlets, and also be the home of the converter, fuses, and circuit breakers. Shelly wants the galley counter higher, and after realizing we can't fit a regulation cooler under there, I reluctantly agree. So we may have taller cleats back there. Of course, we chose to put a large utility space in the front for the AC, so we have to pay for it with less room in the galley. I believe that we will still have room in the front to store our eazyup above the AC, and some sort of chairs next to it, along with a folding table and privacy tent. Anyway, we are making progress. We won't glue this wall in until I've re-varnished the other one and make sure they match! But it's damn cool to have a wall upright. Starting to take form. tony.latham wrote: But it's damn cool to have a wall upright. Starting to take form. And thank you for the suggestions and advice the past year. Think we took most of them. Since we are building on the trailer, the only problem I see will be painting/monstalining around the spare tire bar. To avoid losing all of the alignment with our floor bolts, we may leave one in and swivel the body out a few inches. Anyway, it does feel good to make progress. Slow though it is! Thanks to a snow storm that made a three day weekend into a four day weekend, the walls are up and glued! We used PL Premium 8x, and did it in three steps with enough time for the glue to dry (mostly) between each: First the right wall clamped to a dead man; then the two bulkheads, with the left wall screwed in place as a guide; and finally the front and left wall. We'll fix that with some sort of decorative trim. Wonder if we can find some quarter inch triangular shaped bass wood, or similar? I suppose the very slight bowing makes the walls all that stronger. Or at least that's what I'll tell myself, since there is nothing we can do about it anyway. We'll also have to fill the holes from those drywall screws with epoxy. Also have four in the floor for the dead man to fix. Because of our vertical back, the hatch seal overhangs a little. We still have to figure out a good way to seal the bottom of the hatch against the floor. I feel so good to have reached this milestone! Dozens of things to do now, but nothing that is so new to me as to make me nervous, until we get to fiber glassing the roof, rounding the edges, and fiber glassing those. Plenty to do between now and then though!